Pocket Discs are soft, artsy fliers. Their cotton form is easy on the hands but strong in the winds. Handmade in Guatemala, these cushy discs are like a cross between a hippie hat and a hacky sac—light enough for indoors, but also sturdy enough for outdoors. They’re great for playing catch with dogs, too. The Pocket Discs idea began with a third grade art project. In 2005 Savannah Groft crocheted a doily but added enough stitches that it had a rounded lip. One day Savannah’s father, Patrick, and a friend began tossing it around. To their surprise, the crochet work helped the doily fly straight and true. Patrick decided to bring this kind of disc to everyone, complete with the aesthetic. He found a Maya village renowned for artisan crocheting, and they joined forces. 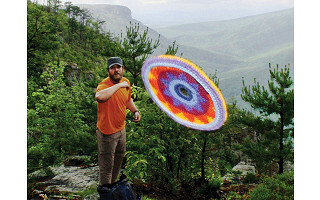 The Fair Wage jobs creating Pocket Discs help improve the villagers’ health and well-being. And to date, the Pocket Disc team has provided over 20 different Guatemalan villages with water filtration systems. Pocket Disc is easily portable in a pocket or backpack. Catch some fun anywhere while supporting a better way of life for artisans and their families. Pocket Discs are soft, artsy fliers. Their cotton form is easy on the hands but strong in the winds. Handmade in Guatemala, these cushy discs are like a cross between a hippie hat and a hacky sac—light enough for indoors, but also sturdy enough for outdoors. They’re great for playing catch with dogs, too. The Pocket Discs idea began with a third grade art project. 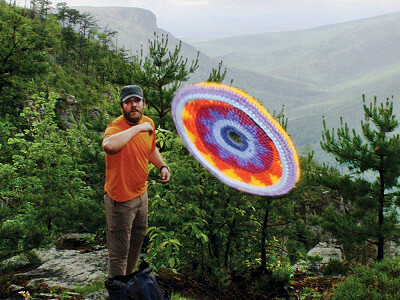 In 2005 Savannah Groft crocheted a doily but added enough stitches that it had a rounded lip. One day Savannah’s father, Patrick, and a friend began tossing it around. To their surprise, the crochet work helped the doily fly straight and true. Patrick decided to bring this kind of disc to everyone, complete with the aesthetic. He found a Maya village renowned for artisan crocheting, and they joined forces. The Fair Wage jobs creating Pocket Discs help improve the villagers’ health and well-being. And to date, the Pocket Disc team has provided over 20 different Guatemalan villages with water filtration systems.